IN A couple of weeks, the corridors and bars of Scotland’s ­universities will throng with freshers, setting out on academic courses that will shape the rest of their lives. And, if they’re lucky enough to live in Scotland, the cost of their tuition fees will be picked up by the taxpayer. Students living across the EU also benefit from this policy. Though, controversially, those who live in England, Wales, and Northern Ireland are required to pay tuition fees should they find a place at a Scottish uni. The Scottish Government, understandably, makes quite the song and dance about Scots students being spared the burden of tuition fees. It’s a defining policy for the SNP. A few days before he stepped down as First Minister last year, Alex Salmond posed in the grounds of Edinburgh’s Heriot-Watt University beside a large boulder on to which was inscribed a quotation from one of his speeches. It read “The rocks will melt with the sun before I allow tuition fees to be imposed on Scottish students”. This monument to government policy, paid for with public money, stands there still; a reminder of Salmond’s ego and the disquieting cosiness that exists between the Scottish Government and some higher education establishments. Critics of the free tuition fees policy argue that it disproportionately benefits middle-class students. Those from wealthier backgrounds are more likely to attend university and there is no evidence to suggest that making tuition free has widened the student population to take in substantially more young people who might come from poorer homes. But, as a principle, it’s unbeatable: this is Scotland and all our young people deserve the very best. All, however, is not quite as it seems with the free tuition fees policy. And there’s real disquiet among some senior figures in our finest higher education establishments. 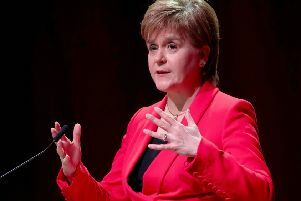 The policy, you see, actually discriminates against some Scots, ­forcing universities to reject them, even if they have the necessary qualifications and skills for their chosen courses. The devil, as ever, is in the detail. Tuition fees for Scottish and EU students are paid for each year by the Scottish Funding Council. Since the academic year 2012/13, the number of full-time places supported by the SFC has remained steady at around 124,000. This figure represents a limit on the number of Scottish and EU students that universities and other higher education institutions – Glasgow School of Art or the Royal Conservatoire, for example – are allowed to accept. After this cap is reached, unis must give the remaining places to students from the rest of the UK and non-EU nations. Now, obviously, the money for all this free tuition has to come from somewhere, and accepting students who are obliged to pay is one way of bearing the burden. And, with around 230,000 students in higher education in Scotland, that’s a lot of people paying up. But the problem, identified by more than one senior figure in Scottish higher education is that the policy begins to work against students who live in Scotland. The principle of free tuition for Scottish students can, for some, mean no university place is available. What happens is this. A Scottish university sifts though its applications, giving priority to students living here. They do this because they want those they educate to remain living here afterwards. They want to retain these skills in Scotland. Of course, that initial sift will include outstanding candidates from elsewhere but, by and large, Scottish students are at an advantage. When the cap on available free places is reached, then there is no option for the institution in question but to begin looking elsewhere. I’m told of instances where Scottish students with better qualifications lose out to students from England because the system prevents universities from taking them. Some Scottish students’ families have offered to pay their tuition fees in order to get around this cap, but this is not allowed. In fact, universities which break the cap on Scottish student numbers can be financially penalised for doing so. One senior figure in Scottish higher education tells me that the free tuition policy means that, on some courses, there are more non-Scots than Scots. As this person put it, the policy is supposed to be about supporting Scottish students but the reality is that it stops some Scots getting the education they want. The SNP talks a very good game on free tuition. It’s a policy that appeals across the board while predominantly benefiting the middle-class Scots whose votes decide elections. But the policy is not all it’s cracked up to be. Scratch the surface and the flaws are soon apparent. Kids from working-class backgrounds, who are more likely to go on to further education colleges, have seen their opportunities contract as the Scottish Government pays out for the better off. More than 130,000 college places have gone as universities bulge at the seams. And no number of meaningless slogans etched on rocks can change the fact that this is a policy that requires serious re-examination. We can, of course, choose to ignore the detail and comfort ourselves with the headline that tuition is free for Scots. But that won’t alter the reality that the policy denies some access to uni courses for which they are eminently qualified. The SNP – which currently has plans to change the structure of university boards, introducing elected members – clearly wishes to dominate the education system just as it has health boards, where cronies are appointed to key positions. It is time for universities to stand up for themselves before the SNP completely neuters them. There is real anger about the reality of free tuition fees and it’s for principals and board chairs to speak out, making explicit just how un­fair this policy can be to Scottish students. The SNP’s claim that it is putting Scottish students first has been taken at face value for too long. Let’s hear more about the impact of this policy from the universities which have no choice but to enact it. Because, as things stand, the rocks will melt with the sun before all Scottish students get free tuition.